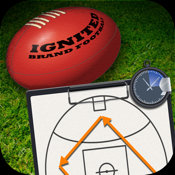 Great Coach AFL is a 21st Century digital version of the traditional coaches whiteboard and much more, designed especially for the iPad by coaches for coaches of Australian Rules Football. Great Coach AFL has been designed for coaches of all levels. Great Coach AFL has many features that will greatly assist coaches of both Junior and Senior football. 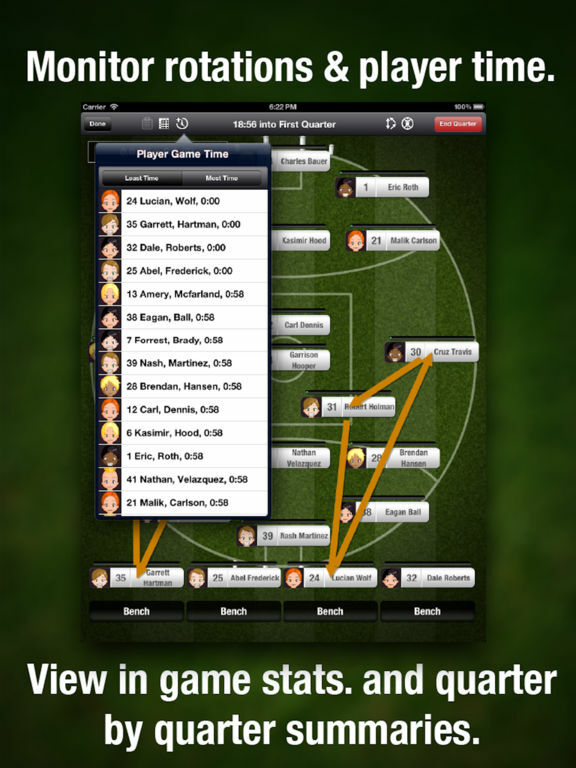 • Send match reports via e-mail from your iPad with scores, goal kickers, best players and the coach’s summary. It's features range from planning and monitoring the required minimum game time of Junior players to the planning of moves and rotations now required to win matches at the Senior level. On match day you can make moves changing player tags to any position, just like you would on a traditional whiteboard whilst the built in clock counts down the quarter for you. But then the ingenuity of the Great Coach AFL app comes into it's own! Great Coach AFL will remind you of the precise time your pre-planned moves and rotations need to be made. The Great Coach AFL whiteboard interface also allows you to record certain key player statistics and observations during the match. By simply tapping on the player's tag, a drop tag is revealed allowing you to tap in stats such as Goals & Behinds and other performance indicators such as leads, tackles, shepherds, blocks, chases and trails. At the end of each quarter the Great Coach AFL app even helps prepare your address to your players. By tapping the ‘Coach’s Clipboard’ icon at the top of the game board, the stats you've tapped in during the quarter appear listed as Positives and Areas for Improvement. It also keeps tabs of your Goal kickers for the match. These stats, including game time for each player, are maintained and the entire season’s statistics can be reviewed at a touch - all in one easy to use application! This app is especially great for coaches of Junior teams when questioned by parents about their child's game time! Great Coach AFL is also a great tool for Team Managers as it allows you to keep important player details such as e-mail and phone contact details - all at your fingertips. Another valuable feature of the Great Coach AFL app for Coaches and Team Managers is that at the end of the match it allows you to send match reports via e-mail from your iPad complete with scores, goal kickers, best players and match summary. At last an app that provides all the information a Coach and Team Manager needs to effectively plan, monitor and communicate with a team, and all for less than the cost of a plain old fashioned coaches white board. Imagine, no more lost name tags! 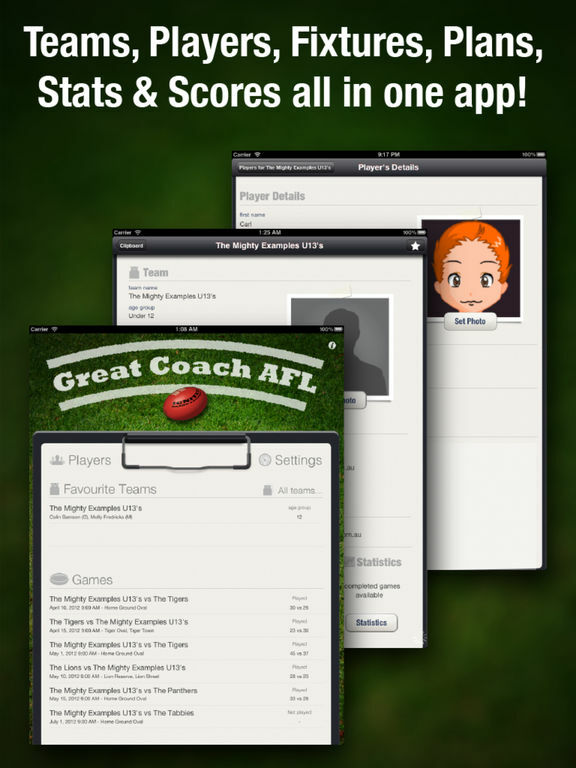 The Great Coach AFL app - the difference between a good coach and a Great Coach!